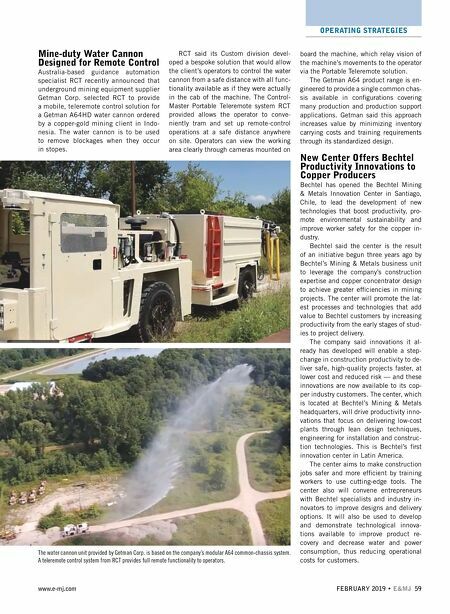 58 E&MJ • FEBRUARY 2019 www.e-mj.com OPERATING STRATEGIES Komatsu America Corp. announced that its FrontRunner Autonomous Haulage System (AHS) has qualifi ed to operate on private Long-term Evolution (LTE) mobile broadband technology. This, according to the company, is the mining industry's fi rst AHS enabled to run on private LTE in commercial operations, making way for ul- tra-high system availability and reliability. According to Komatsu America, min- ing operators demand wireless networks with high-availability, seamless mobility, exceptional Quality of Service (QoS) and the ability to support multiple applica- tions and services simultaneously. Ac- cordingly, the industry is moving away from less predictable wireless technol- ogies such as Wi-Fi, and toward private LTE networks that improve security, ca- pacity, and overall performance within a multi-application environment. The company completed a year- long qualifi cation program at its proving grounds in Tucson, Arizona, conducting extensive testing of the FrontRunner AHS on Nokia's Future X infrastructure, a pro- vider of private LTE communication solu- tions for the mining industry. In a recently published white paper, Nokia explained that while previous gen- erations of mobile technology were all about connecting people using smart- phones, the increasing industrial empha- sis on IoT and autonomous and low-la- tency systems, 5G is about "connecting everything." To meet this vision, devel- opers and operators have set ambitious targets with data rates up to 20 Gbps and capacity increased by 1,000 times. In the paper, Nokia pointed out that a 5G radio network includes open in- terfaces between the radio unit and the edge cloud. Open Radio Access Network (ORAN) enables fl exible deployment and brings cloud benefi ts to radio networks. Part of the baseband processing is locat- ed in the edge cloud, making possible fast capacity upgrades. Among 5G's characteristics is that it can provide low latency combined with high reliability. The target latency for 5G is 1 millisecond, which requires new ra- dio frame design, new device and base station hardware and, in practice, local content or break out with Multi-Access Edge Computing (MEC) and local cloud. Low latency is typically combined with ul- tra-high reliability for new use cases such as robotic control. 5G also sets new requirements for the radio network hardware: low-latency baseband, wideband Radio Frequency (RF) and integrated massive MIMO imple- mentation. Powerful chipset solutions are required to make 5G happen, and Nokia said its Reefshark chipsets are designed to meet these 5G targets. 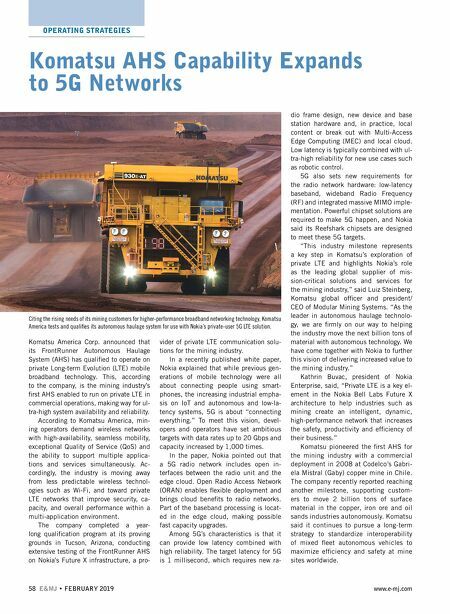 "This industry milestone represents a key step in Komatsu's exploration of private LTE and highlights Nokia's role as the leading global supplier of mis- sion-critical solutions and services for the mining industry," said Luiz Steinberg, Komatsu global offi cer and president/ CEO of Modular Mining Systems. "As the leader in autonomous haulage technolo- gy, we are fi rmly on our way to helping the industry move the next billion tons of material with autonomous technology. We have come together with Nokia to further this vision of delivering increased value to the mining industry." Kathrin Buvac, president of Nokia Enterprise, said, "Private LTE is a key el- ement in the Nokia Bell Labs Future X architecture to help industries such as mining create an intelligent, dynamic, high-performance network that increases the safety, productivity and effi ciency of their business." Komatsu pioneered the fi rst AHS for the mining industry with a commercial deployment in 2008 at Codelco's Gabri- ela Mistral (Gaby) copper mine in Chile. The company recently reported reaching another milestone, supporting custom- ers to move 2 billion tons of surface material in the copper, iron ore and oil sands industries autonomously. Komatsu said it continues to pursue a long-term strategy to standardize interoperability of mixed fl eet autonomous vehicles to maximize effi ciency and safety at mine sites worldwide. Komatsu AHS Capability Expands to 5G Networks Citing the rising needs of its mining customers for higher-performance broadband networking technology, Komatsu America tests and qualifi es its autonomous haulage system for use with Nokia's private-user 5G LTE solution.